One day my son accompanied me to the grocery store to do some shopping. He was wearing his military uniform at that time and when people saw him they kept stopping him to shake his hand, to talk to him, or to tell him to keep up the good work. They were proud of him. They honored him for his service. You know, as a mom, how I felt. Are dads the only ones who can stick out their chest and feel like, “That’s my boy?” I’m just kidding. But, I really thought it was something special for people to recognize him and his service to our country in that way. As much as I love the many fields in which one can be honored (military, teachers, firefighters, police officers, etc. ), no one deserves our respect and adoration more than God. It is customary to stand to our feet when a judge enters a courtroom and there is a hush in the crowd when they bang that gavel. What about God? Too many go through their day without ever considering the fact that hey, He is God, and He should be before all others. With that realization in hand, I want my life to reflect that great truth. I want every word, every action and every thought to magnify the greatness of who He is and all of His glory. When I go about my day I want people to see Him in me. Do I make mistakes? Oh, yeah! But, I have a goal. I aspire to do better and to be better every day. God has been so good and wonderful to me, and I feel that as His child the least I can do is showing Him the honor due Him. “Give unto the Lord, O ye mighty, give unto the Lord glory and strength. Give unto the Lord the glory due unto his name; worship the Lord in the beauty of holiness,” (Ps. 29:1-2). These two verses have been among favorites of mine for many years now. When you think of “giving to the Lord” one realizes just how futile our efforts can be because of His vast greatness. But, something that each of us can give is honor. Not only can we gift it to Him, but it is a gift that He in turns honors. 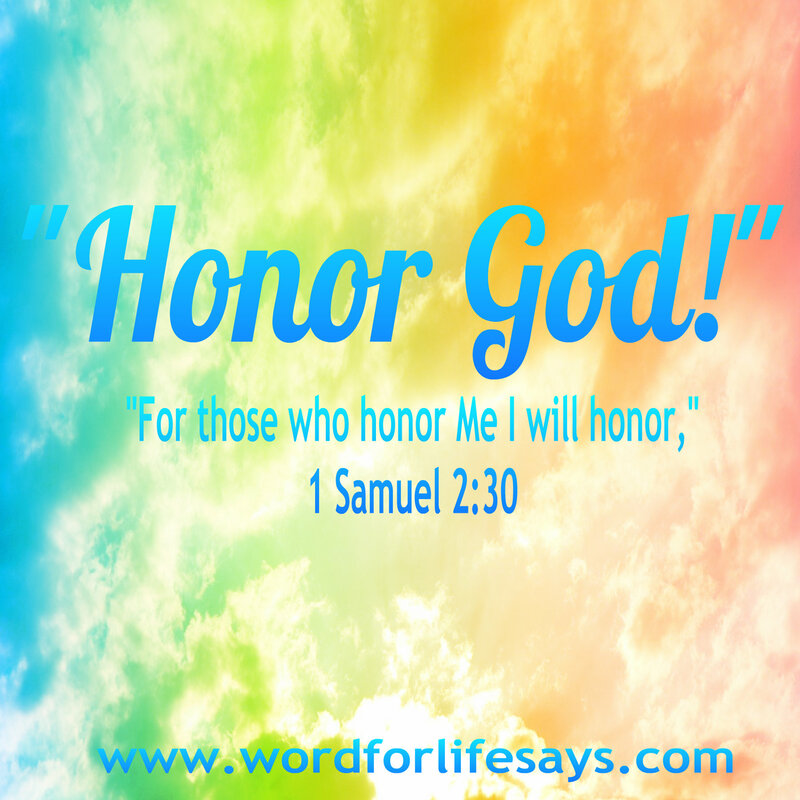 “For those who honor Me I will honor.” Our God is an appreciative God and He believes in rewarding them that diligently seek Him (Heb. 11:6). If you don’t like the returns you have been getting in life examine what you have given. And let me make myself really clear at this point. I do not want you to see the above statement as to how you can get something from God. These things will happen because it’s what the Bible promises. Instead, I want you to just focus on God because He is God and not what you can get from Him. Pingback: “Faithful God, Unfaithful People” Sunday School Lesson Summary and Activities, Numbers 25:10-13; 1 Samuel 2:30-36 | Word For Life Says . . .
Pingback: “The Greatest Commandment” Sunday School Lesson, Leviticus 19:18; Deuteronomy 6:4-7; Mark 12:28-34, May 25, 2014 | Word For Life Says . . .
“I want my life to reflect that great truth. I want every word, every action and every thought to magnify the greatness of who He is and all of His glory.” -love this! My goal as well. “If you don’t like the returns you have been getting in life examine what you have given….” -yes & yes! Amen to this. Truly enjoyed your post, thank you! Blessings.